Thanks for your post. Unfortunately I've noticed this happening way too often. 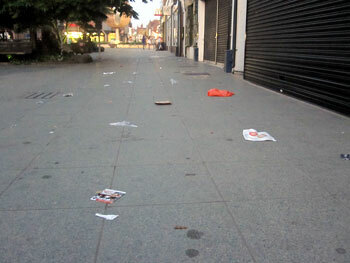 I live in London and it shocks me how people just throw their garbage on the sidewalk or just leave it on the street. I guess people assume the council will clear up the rubbish. It's really strange, since I've grown up being taught by adults and the great Give a Hoot don't pollute campaign that you just do not throw garbage on the ground. Do you think it's just a matter of people thinking that the dustmen will collect it? No, I don't believe they think at all. It is of no concern to them that their country looks like a toilet. I think alot of it trickles down to a couple of attitudes that involve 1)people thinking the council should do EVERYTHING for them (they have been telling them how to do everything for years) and 2)the attitude of many young folks that leaves them caring about nothing but their own immediate needs. I raised my children to respect the world around them. I would knock their heads together if they ever pulled crap like throwing their trash an the ground. Reminds me of a friend whose car was "egged" while driving around her part of Devon. She got out of the car, marched over to the couple (who appeared to be about 20) and told them off something rotten. They ended up not only apologising to her, but walking over to her husband at the driving wheel and saying sorry to him too. Don't try it in New York tho - there's a video out at the moment about a woman on the train there, who commented on a young girl who was eating a full dinner. The girl and her friend turned on the woman and it became an all out fist fight with other commuters having to separate them. Sadly, you are right. Not all the young people act that way though. It seems to be the current trend amongst the youth, to make an exhibition of themselves. It is not the older generation usually, but we could do a lot better. 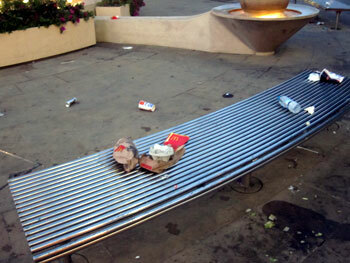 I am originally from England and the amount of litter is shocking. I think there are certain people that do have respect for their country and myself and my children are included.If I ever caught my kids dropping litter they would not hear the last of it. Yet again there are some people that do not have any respect what so ever, even when caught red handed. I would say there is a lot of English children that are taught manners from a very early age, but just like here in the US there are some people that spoil it for everyone. We don't have so much of a litter problem here in our small Midlands town, but when I go back to south Wales to visit my parents I find it really depressing how much litter there is around the park where I walk the dog. There's also a beautiful country park near Coventry, and if I go there on a Monday morning it's often stuffed with rubbish from the weekend visitors, and the staff spend the whole morning clearing up. It's disgusting. I would slap my son if I saw him drop litter. When I visited Australia and New Zealand there was hardly any litter there. Yet another reason to emigrate!